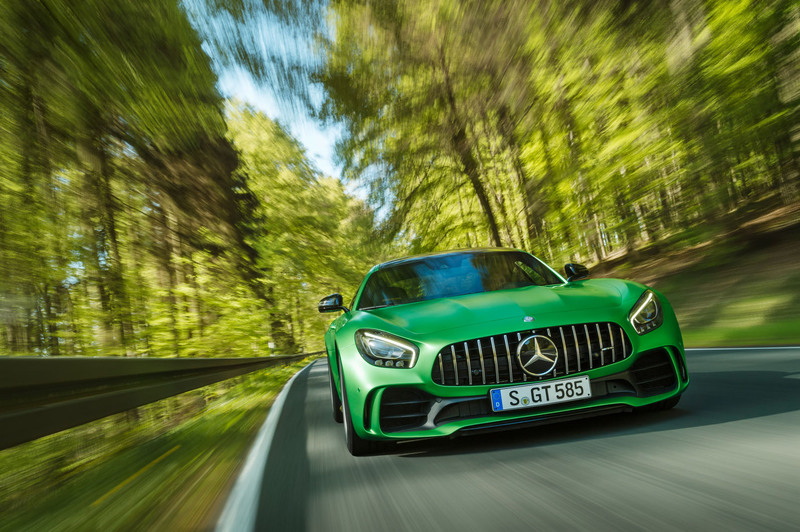 Mercedes-Benz’s AMG performance division has lifted the veil on its most advanced road car to date: the 577bhp twin-turbocharged 4.0-litre V8-powered GT R.
The new range-topping GT model is billed as a road-going version of the German car maker’s Nürburgring 24-hour race-winning GT3, and was revealed at Mercedes-Benz World in Brooklands. The GT R will go on sale in November, although right-hand drive UK deliveries aren’t planned to begin until next March. Pricing has yet to be announced, although officials suggest there will be a considerable premium over the £110,510 GT S. Production will not be limited. The rear-wheel- drive GT R has the most powerful version yet of Mercedes-AMG’s M177 V8 engine. The 4.0-litre petrol unit receives new turbochargers, a reworked engine mapping program and a higher compression ratio. 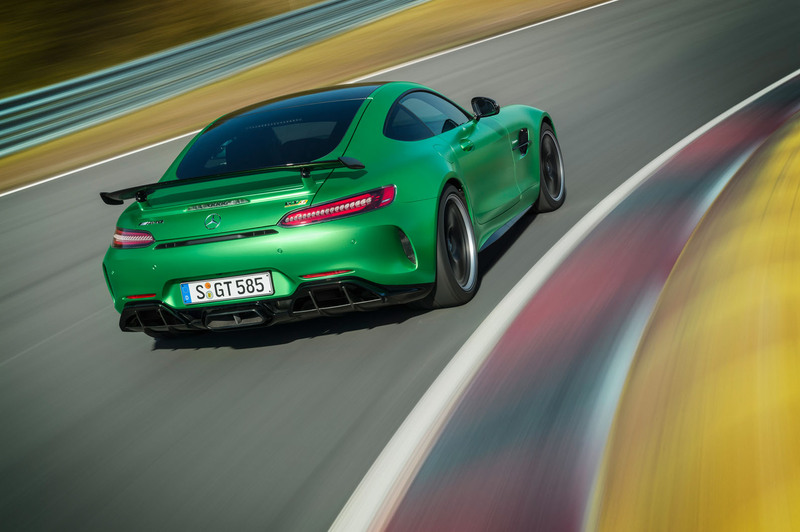 The 577bhp power output is an increase of 74bhp over the GT S, and torque has risen by 37lb ft to 516lb ft.
Mercedes-AMG has also focused on lightening the GT R. To that end, it has forged 20in aluminium wheels and a titanium silencer. There is also a carbonfibre roof, less sound deadening material and less equipment. This all gives the car a power-to- weight ratio of 371bhp per tonne. The GT’s AMG Speed-shift seven-speed dual-clutch automatic gearbox has also been fettled with a longer first gear ratio and a shorter top gear. The final drive ratio has also been shortened and the Race start function made even more aggressive. Its official 0-62mph time is 3.6sec, 0.2sec faster than the GT S. Yet despite claims of added traction brought from the uniquely tuned electronic limited-slip diff, wider rear track and 325/30 Michelin Pilot Sport Cup 2 tyres, it can’t quite match its main rival, the Porsche 911 GT3 RS, which does the sprint in 3.3sec. A whole series of changes to the exterior styling includes the adoption of a co-called Panamericana grille from the GT3 that is set to become a key design element on future AMG models. There’s also an active diffuser element mounted within the underbody that motors forward by 40mm above 50mph in Race mode; it is claimed to reduce front axle lift by 40kg at 155mph. AMG has also fitted the GT R with a carbonfibre rear wing that combines with the wider body to give an added 155kg of downforce at 198mph. Despite the additional aerodynamic addenda, AMG says the GT R has a lower drag coefficient than the GT S. This is reflected in its 198mph top speed, which is 4mph up on the GT S despite the shorter top gear and final drive. In a bid to give the GT R the handling prowess to match its rabid performance, AMG has fitted it with a new carbonfibre cross-member that’s mounted under the exhaust and new carbonfibre torque tube and is claimed to increase torsional stiffness by 7.5% over the GT S. There is also a carbonfibre engine brace to stiffen up the front end. Underpinning the new AMG flagship is a heavily reworked double wishbone suspension system developed from that of the GT3 racer. A so-called AMG Dynamic Select function provides a choice of three damping characteristics: Comfort, Sport and Sport Plus. Up front, the wishbones, steering knuckles and hub carriers are manufactured out of forged aluminium in a move that provides a reduction in unsprung masses. AMG has also fitted new uniball bearings to the rear wishbones to provide greater toe-in and camber control than with the standard bushings. The biggest change to the chassis, however, is reserved for the steering. Together with a speed-sensitive variable-ratio rack, the GT R is the first Mercedes-AMG model to have rear-wheel steering as well. Below 62mph, the rear wheels are turned in the opposite direction to those at the front, to give the GT R added manoeuvrability and agility. Above 62mph, the rear wheels turn in the same direction as the front wheels, giving the car added steering response and stability at high speeds. Two electro-mechanical motors are used to provide the steering effect at the rear up to a fairly conservative angle of 1.5deg. In light of the various changes to the chassis, AMG claims a 47/53% front-to- rear weight distribution. The standard brake package contains uses steel ventilated and perforated 390mm front and 360mm rear discs. However, buyers can also order optional carbon-ceramic brakes, with 402mm front and 360mm rear discs. 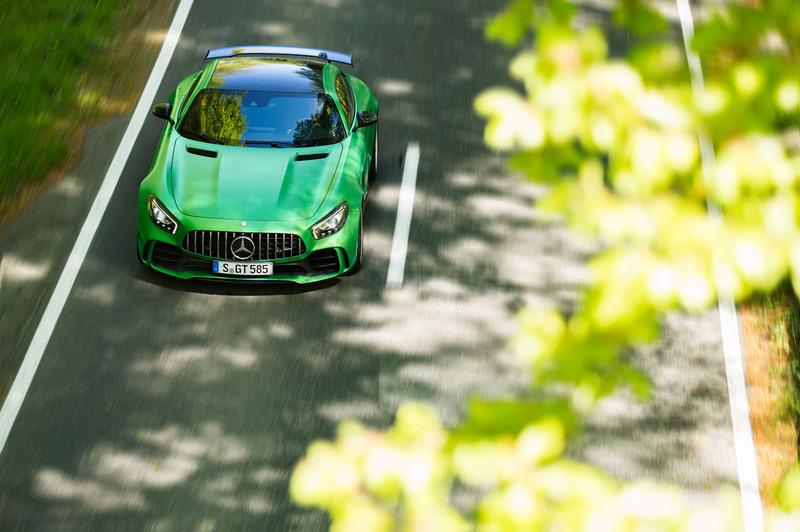 AMG unveiled the new car in an exclusive colour known as ‘Green Hell Magno’. This was in deference to the development program of the GT R, which centred on the notoriously demanding Nürburgring Nordschleife circuit in Germany, a circuit that’s also known as the ‘green hell’. Fantastic bit of kit. GT3 version is a joy to see and her. Sadly, I need a lottery win.